Discussion in 'iPhone' started by VDubb, Sep 14, 2014. Reading through numerous forum posts, it seems that iPhone 6 Plus buyers are getting screwed over on delivery dates, leading me to believe that the inventory is extremely restricted on the iPhone 6 Plus. Still, it's difficult to tell because a lot of the forum posts are littered with talk in standard iPhone 6 orders. So I just people to post their pre-order status for their iPhone 6 Plus only. Do not bring up status on standard iPhone 6 orders. Nice Spaz! You're one lucky guy! I am still waiting to hear from T-Mobile on my order. I ordered Space Grey, 64 GB version very soon after 3 AM Eastern Time, and I'm showing shipping between 10-2 and 10-13. Gold AT&T 16GB 6+ now in UPS' system with a valid tracking number for delivery on 9/19. Order placed via Apple.com around 12:30-12:45am PST. Glad you guys are getting it sooner. So it seems Apple.com pre-orders are coming through. Anyone order through AT&T or Verizon seeing their iPhone 6 Plus arriving on the 19th? 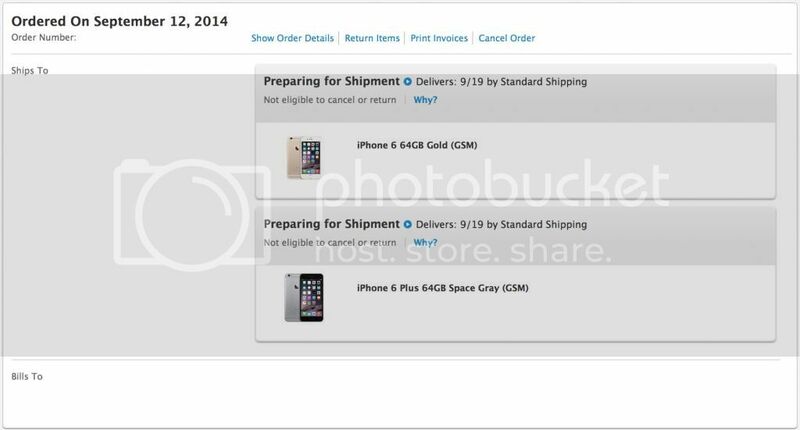 Apple 64GB gold and space grey - both preparing for shipment to arrive 9/19. Verizon 64GB gold - no updates, supposed to deliver by 10/7. Apple 128GB Gold. Preparing for shipment. 9/19 ship date. Ordered around 10am PDT on Friday. 6 Plus, 64GB, Space Grey on TMobile. Showing 3-4 weeks, 10/13-10/19 delivery. Haha, my Apple.com order page looks exactly like this in every way, except it says CDMA instead of GSM. I know this thread is specifically for iPhone 6+ shipping information but I though I would also add that I ordered two iPhone 6's before I ordered the 6+ I mentioned above and while both of them are also listed as 'preparing for shipment' UPS has not received tracking information for either of the non-plus models, which leads me to believe the 6+ models are probably drop shipping direct from China while the 6 models may have already made it state-side. Like everyone else who ordered a iPhone 6 plus 128GB from verizon's website, I have only had my pre-order confirmation. There is no full charge on my card, nor any shipping info. I doubt we will get it today, and i doubt verizon has the 128gb plusses yet. Maybe tomorrow. I'll be out of town on launch day, but hopefully it'll ship earlier than it's saying now. I'm hoping T-Mobile gets them in tomorrow as well. What day and time did you order yours? I ordered mine Friday around 10pm. I am with you. Got my confirmation email at around 9:30 pm EST ... I may line up on Friday and see how my chances are and cancel my preorder if need be. I will be in heaven having my iphone 6 Plus JB with all my hacks installed. Really looking forward it to and hope they dont take 5-6 months to get a JB released. Maybe line up at Apple and hope for the best and if lucky just cancel the online preorder.